VILLAS AND APARTMENTS TO RENT IN BENAHAVIS, SPAIN. 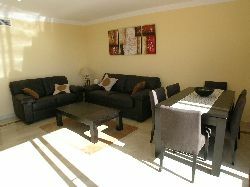 Welcome to our selection of holiday homes to rent in Benahavis, Spain. Located in the mountains high above the Costa del Sol, the village of Benahavis has become a popular place for tourists staying in Marbella and Estepona to visit � especially on a lunch time or in the evening to take advantage of the many high class restaurants that can be found in this small community. Benahavis has even been called the dining room of the Costa del Sol because of the unusually large number of eateries that have been established there. Only seven kilometres from the coast, tourists can even enjoy a few glasses of wine with their meal, knowing a taxi back to the hotel or apartment will not be too expensive! Golfers are well catered for too, as the Benahavis region is home to 12 golf courses; a number that is likely to increase over the next few years. Montemayor Castle is one of the most popular tourist attractions in the Benahavis area, if you can tear yourself away from the restaurants for long enough to take a tour. The oldest parts of the structure were built in the 10th century, though more buildings and towers have been added over the centuries. While some parts of the castle, and the defensive ring of smaller forts around the village, are little more than ruins, the Torre de la Leonara is still fairly well preserved and offers an impressive view of the surrounding countryside and down to the sea on a clear day. The Daidin tower is another important architectural structure, noted for its unusual square shape. The village church is another unusual building, originally built with just one nave, rather than the usual cross shape seen in Spanish churches. Las Angosturas is a narrow canyon that follows the path of the River Guadalmina as it leaves Benahavis. Now an area noted for its animal and plant life, it is a beautiful spot to take a stroll through the mountains and woods, though the path is not suitable for pushchairs or younger children. Walkers following the river will eventually come to the Charca de las Mozas, or Charca de los Novios as it is sometimes called, a stretch of the Guadalmina where the current flows stronger and faster, creating whirlpools and rapids. If you are very lucky � and very quiet -you may be able to spot one of the more rare residents of the Benahavis region, a species of deer called Mofl�n del Atlas which usually only lives in Africa. The Guadalmina is also popular with local fishermen, though if you fancy trying your luck with a rod make sure you get the appropriate paperwork and permits from the town hall. The village's restaurants may be well known for their typically Andalucian pork dishes, but any fish on the menu is bound to be fresh, coming either from the river or the Mediterranean itself. Looking for self catering holiday accommodation in Benahavis? Then below is a selection of apartments in Benahavis and villas in Benahavis that can be rented direct from their owners. You can either click on each listing for further details or you can use our search engine on the left if you are looking for something in particular. Montemayor Castle - Why not visit a castle? The oldest parts of Montemayor Castle were built in the 10th century. Over the years, more towers and buildings. Even though some parts of the castle, and the defensive ring of smaller forts which are located around the village, are little more than ruins, the Torre de la Leonara is still fairly in good condition and offers an impressive view of the surrounding countryside and even down towards the sea on a clear day. Fishing - The village of Benahavis is a good place to fish, mainly in the River Guadalmina, which has rapids and whirlpools due to its fast pace, but offers fishing lovers a fishing challenge. Golf - There is plenty of choice for anyone wishing to have a game of golf, as there are Benahavis region is home to 12 golf courses. The Benahavis Golf Club was founded in 1991 as a place where locals and visitors could enjoy a game of golf at a reasonable price. Benahavis is situated in the mountains high above the Costa del Sol. The village of Benahavis has increasingly become a popular place for people to visit for daytrips from other areas such as Marbella and Estepona especially at meal times as there are many high-class restaurants in the area.